A few proactive steps can help you find the right vet for your dog. Start by asking friends, family or neighbors – preferably those who own a dog – for recommendations. Inquire about their own experiences with their pet’s vet. Is he gentle with their dog? Is he a good listener and easy to talk to? Does he communicate in easy-to-understand terms? Remember, that you are your dog’s best advocate – if you’re not comfortable with the vet’s bedside manner, it’s unlikely that your dog will be either. Chances are, if you purchased your dog from a local breeder or animal shelter, they have an established relationship with the local vet community and can refer you to a trusted practice. Even with a recommendation, however, be sure to double-check references yourself! If you’re moving into a new area, ask your current vet if he can give you the name of a trusted colleague or clinic, or refer you to someone who can. If possible, choose a vet that is close to home. Short car rides will help minimize stress to your dog, especially if she is sick or injured. Check credentials: Hone your list down to a few reputable doctors who have graduated from a veterinary program accredited by the American Veterinary Medical Association and hold a current state license. Also check your state’s veterinary medical board website to see if there are any formal complaints filed against them. Office hours: Make sure they are compatible with your own. Find out the average wait time for a non-emergency visit. Fee/rate structure: Vet care can be expensive. Ask what they charge for office visits and annual exams, as well as standard care items such as vaccines, heartworm tests and spaying/neutering. Schedule an office visit: Once you’ve narrowed your list to two or three possibilities, ask to schedule a meeting with the vet and have a tour of the facilities. If you already have a dog, bring her along to see how she and the staff interact. During your visit, take note of the general clinic environment. Is the waiting room spacious, clean and organized? Is the building free of strong or unpleasant odors? Is the staff friendly to you and at ease with your dog? 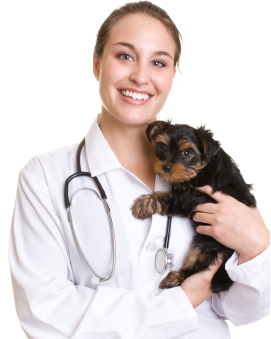 Multi-practice: If the clinic has more than one vet, find out who will care for your pet if he is unavailable. Some practices rotate and share cases; if this is the case, be sure to meet and evaluate his colleagues. Emergency availability: How does the office handle daytime and after-hour emergencies? Is there a vet on-call 24/7? Can they provide night-time coverage if necessary? Specialties: What types of injuries or diseases is the staff trained to treat? Do they consult with a wider veterinary network to treat cases outside of their specialty? Do they utilize the services or facilities of a local animal hospital? Staff turnover:How consistent are staffing levels for vets, technicians and office staff? Low turnover usually indicates a positive work environment and can mean a better experience for you and your pet. Trust your instincts. Even if a vet comes highly recommended they may not be the right one for you or your dog. Take time to research and ask questions before you need a vet’s services; it will help you establish a positive rapport with the right doctor and ensure a better experience for your dog.